In 1841 the US Ordnance Department decided to have 500 percussion “Cadet Muskets” manufactured for use by the Corps of Cadets at West Point. These guns were to replace the M1830 Cadet Muskets then in use, which used the older, flintlock ignition system. The M1841 was the intended to introduce the cadets to the new percussion ignition system that had been officially adopted in 1841 and was about to become standard for all US infantry arms with the adoption of the US M1842 musket. 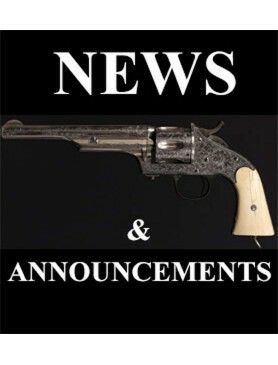 The gun was a designed as a scaled down, percussion version of the M1835/40 musket, as it was actually adopted prior to the M1842 percussion musket. Although 500 guns were authorized for production in 1841, it would not be until fiscal year 1844-45 that they would be produced, and then only 450 would be manufactured. 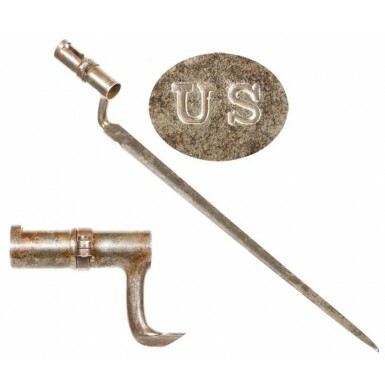 To accompany the muskets, a scaled down version of the US M1835 socket bayonet was adopted as well, the M1841 Cadet Bayonet. The bayonet was about 80% of the size of the larger M1835 with a 14.5” blade rather than an 18” blade, and a similarly scaled down muzzle diameter to fit the smaller .57 caliber bore of the cadet musket, rather than the larger .69 bore of the M1835/40 and later M1842. 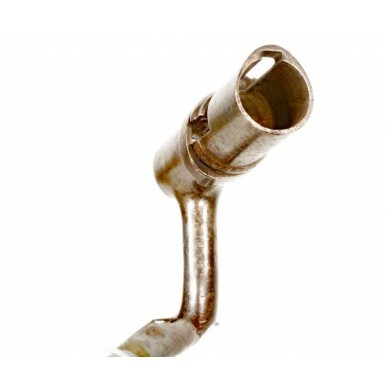 Interestingly, the socket remained full-length at 3”, making it look somewhat out of proportion with the balance of the bayonet. The M1841 Cadet Bayonet was the first cadet issued bayonet to utilize a locking ring, as the earlier M1830 Cadet Bayonet used the friction fit design of its parent the M1816/22/27 series of bayonets. Another interesting difference between the larger M1835 bayonet and the cadet sized M1841 was a return to the older, “prow point” blade of the M1816 series of bayonets, a feature not found on the M1835. As originally produced, the M1841 Cadet Bayonet had a browned socket and a bright blade, that followed the profile of the M1835 with scalloped shoulders at the junction with the neck. The bayonet was mortised for a bottom mounted bayonet stud, as was the M1835, and the bayonet had an overall length of 17.5”. Due to the very small number produced, the US M1841 Cadet Bayonet is one of the hardest 19th century US military bayonets to find on the market today, and is rarely encountered for sale in any condition. Offered here is a VERY GOOD+ condition example of the scarce US M1841 Cadet Bayonet. 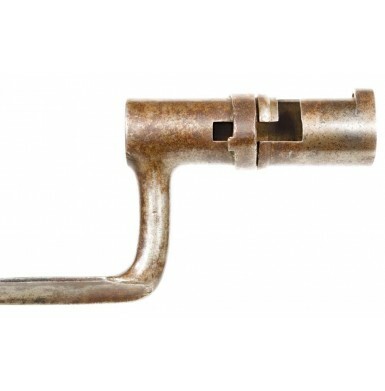 The bayonet remains full-length and complete, including the original locking ring and tension screw. The bayonet is clearly marked US on the ricasso and shows no other markings. The bayonet blade has a mostly smooth, brownish-gray patina, with some lightly scattered pinpricking and minor pitting present, along with some scattered patches of discoloring surface oxidation. 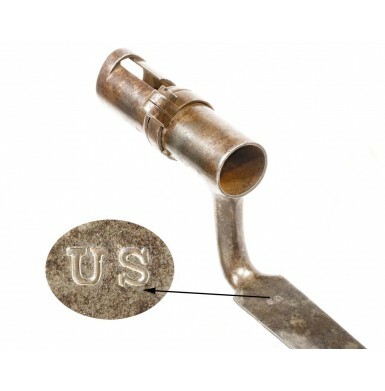 The socket retains none of the original browned finish but does have a moderately oxidized brownish patina over the gray base metal. The socket shows some scattered light pitting, with its condition matching that of the blade very well. This may be the result of the browning, as period complaints from the Ordnance Department regularly mentioned that during the “National Armory Brown” period, browned US M1816/22 muskets often started to rust while in storage, while the bright guns did not. This was one of the major deciding factors in abandoning the practice on infantry muskets. 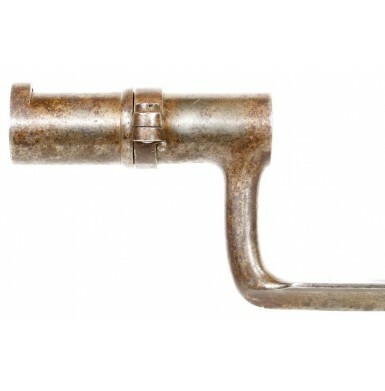 The locking ring remains fully functional and moves smoothly and the socket remains in round, with no bends or dents, with a bore diameter of .70” at the muzzle and .715” at the rear of the socket. Overall this is a nice, solid example of a very scarce US M1841 Cadet Bayonet. 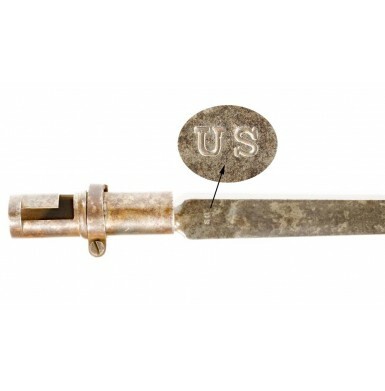 The bayonet remains in very nice condition and would be a wonderful addition to your M1841 Cadet Musket or to a collection of US military bayonets, as even many of the most advanced collections are lacking this important and rare mid-19th century socket bayonet. 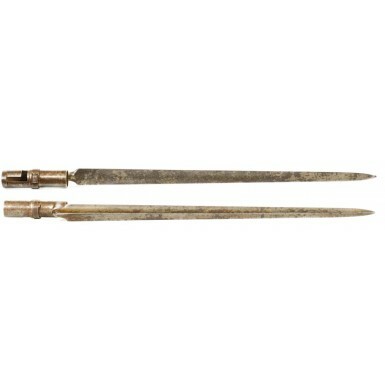 Considering the high prices that these scarce bayonets command, this example is very reasonably priced.